This young male is maturing into something special! Another of Doppler's beautiful son's... This young male is out of one of our best females and our best PR llama, Caledonia's Mya Nose. Nosey is out of one of our foundation females, a beautiful full North American female. Nosey is by an own son of the reknown *Argentine Kobra-one of the original Argentine imports and one of the best imports. Nosey is definitely a mainstay in our herd. She is the first llama to meet you at the gate and introduce herself to visitors. She is also an excellent mother and producer. If this cria was a female we definitely would not be parting with it! 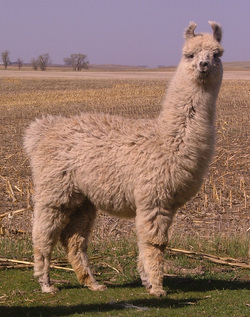 This cria has color, fiber, nice heavy bone structure, beautiful ears, curious easy going personality and upright conformation.